The following video is brought to you courtesy of the Great Big Story YouTube Channel. Click the video below to watch it now. Ever had a glow in the dark dinner? How about a rare Japanese white strawberry? 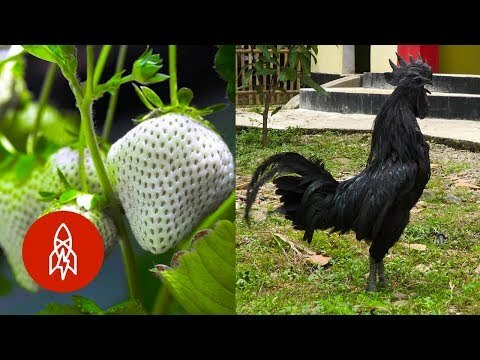 In this reel we travel the world and discover the rarest foods, colors and animals in the world. Trust us, these stories are anything but typical. This story is a part of our Planet Earth series. From mammals to insects and birds to reptiles, we share this great big world with all manner of creatures, large and small. Come with us to faraway places as we explore our great big planet and meet some of its wildest inhabitants. This story is a part of our Frontiers series, where we bring you front and center to the dreamers, pioneers, and innovators leading society at the cutting edge. Let us take you along for a trip to the oft-imagined but rarely accomplished. This story is a part of our Flavors series, where we do so much more than play with our food. Come with us as we dive into deliciously different and tastefully off-beat stories in the culinary world.